PhilTonks2: The Best Job In The World - Finding Bacon Heaven with Chiltern Railways! 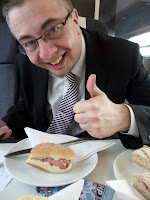 The Best Job In The World - Finding Bacon Heaven with Chiltern Railways! I've had some tough assignments in the world of public transport. From lurking in the rain on an industrial estate for a bus that only runs once every 2 hours to chatting up Welsh barmaids in the hope of finding out local travel information (she didn't know, and I didn't woo her over), this must surely be the biggest challenge of them all. For me, the words "Chiltern Railways" and "bacon roll" go hand in hand. When I had cause to visit London regularly for meetings in my old job, a bacon ciabatta on my journey southbound was what life was all about. I even christened it "Maryleroll" in honour of Chiltern's beautiful London terminus. I never knew that I'd created a monster on Twitter! My lyrical tweetings of approval soon gathered pace on the social networking site and others began using the hashtag #maryleroll in reference to the now legendary bacon experience! Chiltern asked me to help them create the ultimate bacon roll experience. What a challenge! So off we set. Me with the equally legendary Chiltern all-girl Twitter band Emma and Jo, notepads at the ready, in search of the best of bacon. Then its on board the 1055 Chiltern Mainline to London. This "silver dream machine" is close to bacon heaven. Poised at a table with the Chiltern photographer and an ever-eager Emma and Jo, we're presented with various versions of bacon roll to sample. Some smoked, some not. Some in roll form, some baguette. The search for the ultimate bacon experience isn't easy! Does it appear desirable? Substantial? Does the aroma grab me? Is it warm? Does it excite the palate? (I've learnt this from wine tasters). Is it too hard? Too soft? 3. What about added value? What would compliment it? Mushrooms? Egg? Brown Sauce? Maybe Red? How about butter? And what about a "meal deal"? Should it include coffee? As we pull into Marylebone, the decision is made. The ultimate bacon roll is nothing too extravagant. It's soft, attractive and comes with a choice of sauces. It's unassuming, yet classy. And it's designed to tickle your tastebuds as you head to the capital. It's been a long, arduous, challenging thing to do. But you can rest assured that the best bacon rolls anywhere on the UK railway network belong to Chiltern Railways. It's surely the best job in the World!